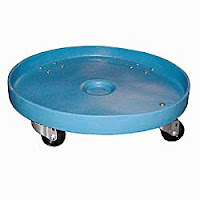 You may want to consider taking some of these Super Heavy Duty Plastic Drum Dollies! They have all the criteria mentioned above and they are available with large quantity discount! The plastic dollies are perfect to carry your drums sizing from 15 to 55 gallons and weighing up to 600 lbs. You can also use them to identify which drums carry what, thanks to the different available colors we have. Also, if you are storing liquid and there may be chances of it being spilled out, the dollies are designed with 2.5" high sidewall that prevents it from being wasted or staining the floor. The 4 pieces of polyolefin 3" swivel casters also make it possible for the dollies to maneuver easily.